If you have a vintage trailer, one of the best ways to improve its overall look is by restoring its old rusty and stained wheels. You don’t have to wait to paint your trailer. Instead, you can go ahead and fix up the wheels yourself by updating them with spray chrome. Here is what you’ll need to do to turn your old wheels into beautifully shiny chrome wheels. To be safe, only work on restoring one wheel at a time. You’ll want to wedge blocks of wood onto the front and back of the wheel that you won’t be working on to prevent your trailer from rolling. Loosen up the lug nuts on the wheel that you will be chroming. Place a floor jack under the metal frame of the trailer close to the wheel that you will be removing. Jack your trailer up so that the wheel os off of the ground, remove its lug nuts and pull the wheel off. It is a good idea to slide a jack stand in place so your floor jack has help keeping your trailer up off of the ground. You can take the tire and wheel to a local tire store and have them remove the tire from the rim for you. If you want to leave the tire on the rim, ask them to deflate it for you. While you can instead choose to mask off the tire from the rim, it’s really easiest to have it removed and placed back on after you are finished. Use a utility knife in order to remove the valve stem from the tire and to break the seal between your tire’s bead and the rim if you didn’t have the shop remove it for you. Make certain to wear a respirator mask while you sand because many old paints contain lead. Use coarse sandpaper and a sander to sand away rust. When most of the loose rust pieces are gone, change to 150-grit or higher sandpaper and continue until the surface is smooth. Sanding is easiest if you lay your wheel down on a raised surface. You will sand it working your way from the edge towards the middle. After you have sanded away all of the rust and loose paint, wipe it thoroughly with paint thinner. Use a paint brush with the solvent to remove grease and oil. After you are finished sanding, drag your utility knife around the radial joints where the center hub and the rim’s outer part are welded. This is to remove paint flakes, dust, dirt and rust that are trapped in the juncture. Use your air blower to blow away all dust and debris. Using a clean rag, dampen it with lacquer thinner in order to wipe down the wheel. You’ll want to move quickly so that old patches of paint won’t be softened. You’ll want to find a spot where you are able to lean your rim at a 45-degree angle against a post or wall. Wearing a respirator, apply four coats of primer. Applying several thin coats of primer is best so that they will be less prone to run. Allow each coat to dry before applying a new coat. If the surface feels coarse, sand it using fine-grit sandpaper until it is smooth, and blow away any dust with your air blower. Take out your PChrome kit. There are four chemical concentrates that are labeled with S, R, D and W. For the S, R and D concentrates, you will mix them in their corresponding bottles with one part of the concentrate to every 30 millilitiers of deionized water that you use. The W solution uses four parts to every 30 milliliters of deionized water. Set these solutions aside and mix your basecoat. Your basecoat is made by mixing together your Permalac 2KA and Permalac 2KB together in a one-to-one ratio. You’ll then add 20 percent of the 2K blac reducer to the mixture. Then, apply the basecoat over the wheel’s entire surface using horizontal sprays and working your way to the top. Once you have applied your basecoat, let it dry for at least 24 hours. Spray your W solution followed by the D solution all over your rim and then rinse it off with deionized water. Repeat these steps and then move on without letting the surface dry. Your chrome rim paint is the metallizing layer that is composed of the S and R solutions. Spray these on using your dual-nozzled sprayer. For the best chrome rims, apply several layers of the metallizing solution until you reach the desired shine. Mix your topcoat in the same way that you mixed your base coat, but be sure to use the clear reducer in place of the black. Spray it on quickly and lightly using horizontal passes. Your chrome wheels will be fully cured and dried in about 48 hours. You can then apply another topcoat for superior protection and beauty. Order Your Spray Chrome Kit Today! 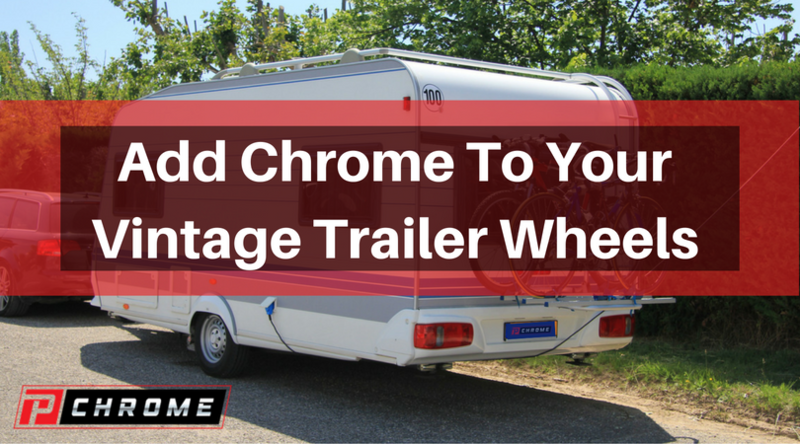 Chrome rims can make your vintage trailer look much better. To order your PChrome chrome spray kit, order it on our website or call us today.